NOTE: Information for Grand Cherokee with 5.2L V8 engine is not available from manufacturer. 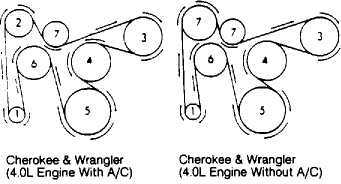 On Cherokee 4.0L engine with heavy-duty cooling and/or air conditioning, an auxiliary electric fan operates whenever engine temperature exceeds 190F (88C), or air conditioner is on. 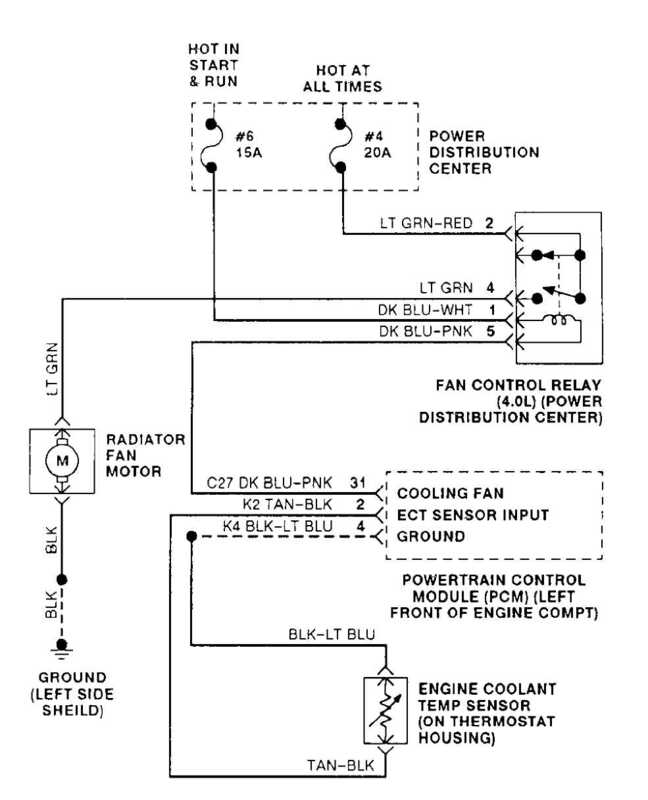 If Powertrain Control Module (PCM) detects a fan control circuitry problem, a fault code will set. appropriate SELF-DIAGNOSTICS article in ENGINE PERFORMANCE. COMPONENT TESTING. Remove cooling fan relay from PDC. Start engine. Using a test light, check for power at terminal No. 2 (Light Green/Red wire) of PDC. If test light does not illuminate, repair open circuit in Light Green/Red wire between terminal No. 2 and fuse No. 4.
left side of fan shroud. fan harness connector and ground. are okay, test relay. See RELAY under COMPONENT TESTING. If relay does not click, put DRB-II into voltmeter mode. 10 volts or more, turn ignition off and reconnect relay. PCM terminal No. 31 and PDC terminal No. 5. Unplug fan motor connector at left side of fan shroud. Connect a jumper wire from terminal "B" (Black wire) of fan motor connector to a known good engine ground. Using another jumper with a 25-amp in-line fuse, supply battery power to terminal "A" (Red wire) of fan motor connector. Service fan motor if it does not run. Fig. 1: Identifying Fan Relay Connector Terminals Courtesy of Chrysler Corp.